Infants are baptised at the request of their parents, usually in the first year of life and in their home parish. At least one parent should be Catholic. 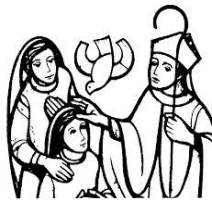 In the year when the children turn eight (Year Three), they are sealed with the gift of the Holy Spirit in the Sacrament of Confirmation administered by the Bishop or his delegate. 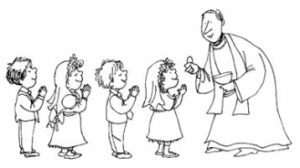 In the year when the children turn nine (Year Four), they are welcomed to the Lord’s Table and receive Holy Communion for the first time. This is the climax of their Christian initiation. Once children have turned eight (Year Three), they are no longer candidates for infant Baptism. If they have not been baptised, they are enrolled in a modified catechumenate leading to the celebration of Baptism, Confirmation and First Communion at Easter. 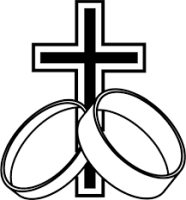 However, because of the importance of the peer group in the catechumenate process for children, the celebration of their Christian initiation may also be aligned with the parish celebration of Confirmation and first Holy Communion. Introducing children to the greatness of God’s mercy in the Sacrament of Penance is a two-step process. A simple celebration of the second rite of the Sacrament of Penance is included as part of the preparation for First Communion. 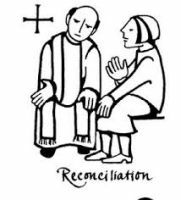 In the year when the children turn ten (Year Five), they are prepared to celebrate more fully the Sacrament of Penance with individual confession and absolution (the first rite). This builds on the work of the previous year as they take the second step and learn in greater detail what it means to examine their conscience. The first point of contact is the Parish Office. All those who had never been baptised or who had been baptised in another tradition or who had been baptised Catholic but not received the Sacraments of Confirmation and Eucharist are invited to join the RCIA. Just start from where you are now. 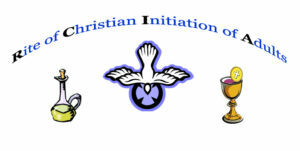 The RCIA takes place within the context of the parish community and after a suitable period of formation, culminates in the reception of the Sacraments of Initiation – Baptism, Eucharist and Confirmation at the Easter Vigil. If you or someone you know is interested in finding out more about becoming a Catholic / the Catholic Church, please contact the Parish Office for more details.